Sothink SWF Easy now supports Windows 8! We are glad to inform everyone that Sothink SWF Easy has been updated. And now it supports Windows 8. For Beginners: This Flash banner maker offers abundant useful resources for quick Flash banner making, such as multi-style templates, hundreds of resources, 60+ animation effects, etc. For Experts: You can find FULL customization features that totally exceed the common online banner generators. This Flash banner maker also enables you to extract resources from existing SWF files for convenient re-use and therefore greatly simplify your own design work. Spooky, kooky, creepy, and fun! The Halloween Day is coming soon! Itâ€™s the time of Ghosts, Goblins, Gravestones and Graveyards. Imagine the candy corn, jelly apples, pumpkins and bats. Want to export SWF to GIF format? This can be easily done in Sothink SWF Easy.It is useful for those who need GIF format from a flash banner but do not want to recreate a new image. Animated GIF banner can be substituted for flash banner in some way. Because of its small size and image format, GIF banners can be easily published to webpages, and they won’t run the risk of being blocked by ad filters, either. Usually the GIF file is created by some professional image editor, which is not so easy for the beginners to operate. 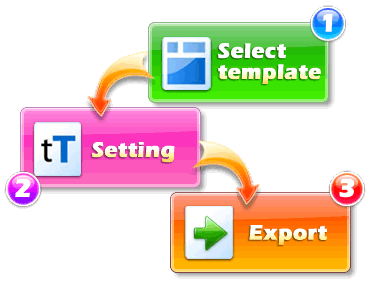 So we suggest you try our flash banner maker – Sothink SWF Easy: Just go to File > Export Movie and save it as GIF format, but the precondition is that you have completed a flash banner work in Sothink SWF Easy. Try the Best Flash Banner Maker! The most popular Flash banner maker, Sothink SWF Easy, has been released the latest version 6.3 several days before. This powerful banner maker supports Windows 7 completely in V6.3, and the more users could enjoy the fantastic banner software from now on. Besides, it has enhanced a lot in other features, such as â€œadded link settings for the main sceneâ€, â€œcombined the tab â€˜Propertyâ€™ for object, movie and sceneâ€, â€œenable to replace element between the same or different file typesâ€, etc. In this new version, the banner creator provides 60 new templates, a resource library with hundreds of elements, and 60+ Flash effects. The templates cover eight colors and four sizes which comply with general industry specs. The Flash effects can be combined freely to form numerous new effects. Moreover, it has optimized the window of the flash banner template as well. So, would you like to have a try? Try to create ad banner, simple flash, or even GIF animators with the banner design software?